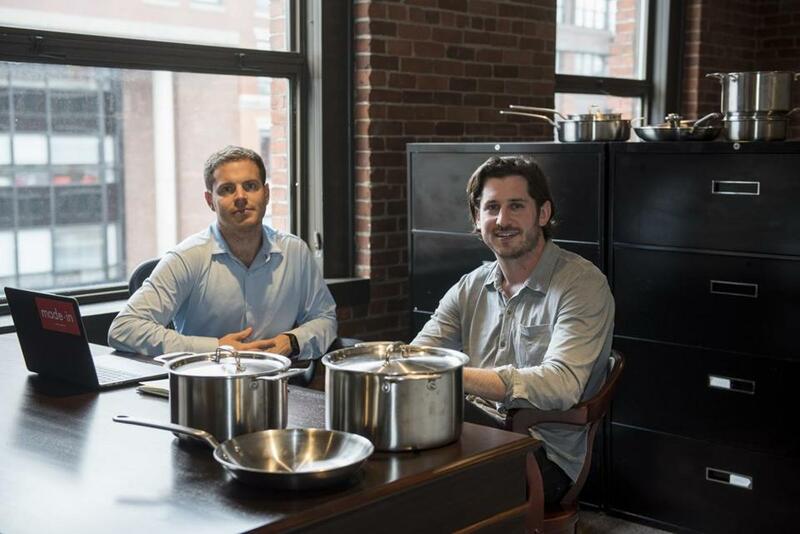 Johnathan "Jake" Kalick (right) and Bradford "Chip" Malt run Made In, a kitchenware startup that aims to cut out brick-and-mortar middlemen with a direct-to-consumer online business. The species shops at Whole Foods and orders meal kits from Blue Apron, scans Food52.com for recipe ideas, and then documents dishes on social media before consumption. But a strange discrepancy arises when you survey members of the species in their natural habitat. Examine the kitchen in any post-college apartment, and you’ll find a cross-section of cookware that is more castoff than cast iron, with a selection of pots and pans that tend to be culled from parents’ basements and trips to Target and Ikea. Although these twentysomething foodies openly obsess over their food, they are generally clueless about the cookware needed to actually prepare their meals. And that has led some in the industry to see an opportunity, with brands emerging (or evolving) to serve them in the most literal sense of the word — by creating new product lines designed with the deep-pocketed millennial in mind. The coming “disruption’’ of cookware is a logical extension of the shifts we’re seeing across the food industry, as young adults devote an extraordinary amount of “money and resources and time” to new ways of sourcing their meals, said Jonathan “Jake” Kalick, whose family owns Harbour Food Service, a Boston distributor of restaurant equipment. Although his generation loves eating well, “they don’t know the tools or care about the quality” of their kitchen supplies, he said. He and friend Bradford “Chip” Malt saw an opportunity in this discrepancy and this month launched Made In, a company making pots and pans for young urban professionals. The frypans and stockpots, which are designed by a Tennessee-based manufacturer, offer the same quality 5-ply construction as high-end brands like All-Clad and Calphalon, Malt said. But Made In aims to undercut their prices by selling them direct-to-consumer through its website. The company sells a stainless steel 10-inch frying pan for $79; a similar pan from All-Clad retails for $150. “Our goal is to become the go-to brand in the kitchen space for millennials,” Malt said. “The millennial age group has the most purchasing power of any demographic in the US, and it’s also growing as fast or faster than any other age group,” said Taylor Palmer, a retail analyst at IBISWorld. Pair that purchasing power with the fact that many millennials are hitting a stage in life when they’re setting up home, and it’s a compelling force for commerce. US kitchen and cookware stores already account for $15.2 billion in annual sales, and that’s just from specialized stores like Williams Sonoma and Sur La Table, not mass-market retailers like Macy’s or Bed Bath & Beyond, he said. The result has been a surge in saucepan sales. 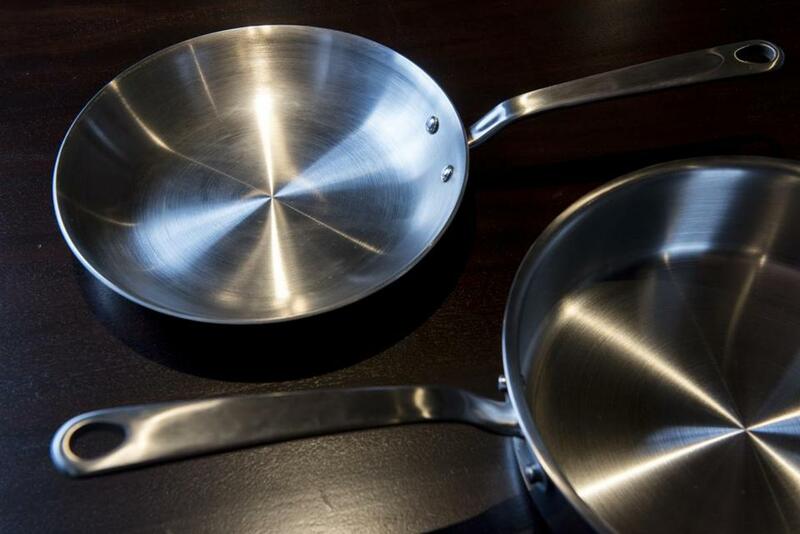 “Cookware is very hot right now,” said Joe Derochowski, NPD Group’s home industry analyst, with sales up 9 percent this year, after a 6 percent rise the year prior. The reason, Derochowski said, is a confluence of demographic shifts. Yes, millennials are beginning to settle down, establish homes, and increasingly invest in kitchen goods, but at the same time, baby boomers are beginning to downsize and are happy to unload a pantry full of scratched-up pans in favor of something new. On top of that, both generations are cooking more to respond to health concerns, he said, leading to a market that hasn’t seen such an uptick in sales since the 1970s. Williams Sonoma, in particular, has seen its stock price increase lately, and was up 1.9 percent in revenues in its second quarter of this year. The company’s chief executive, Laura Alber, has said the brand is in the midst of a “refresh” designed to meet these demographic demands. “If you looked at our assortment a couple of years ago, we offered mostly stainless-steel and copper cookware,” said Lauren Tarzia, a company spokeswoman. “Now, in response to customer demand, we offer specialty, induction, nonstick and ceramic nonstick” pans, in addition to a line of Williams Sonoma private-label cookware at a lower price point. Where and how cookware purchases are made is also changing. Eighteen percent of sales are now made online, up from 14 percent in 2015, according to NPD Group, with home decor sites like Boston-based Wayfair and Overstock increasingly competing with Amazon for eyeballs. And those shopping options continue to evolve. Instacart users can buy measuring cups or foil pans when they put in an order for groceries, and the meal-kit company Blue Apron has its own marketplace, allowing users not only to purchase boxes of ingredients, but the knives, pans, and, yes, blue aprons to use in the kitchen. The company’s cofounder and chief executive, Matt Salzberg, has said it plans to expand these “a la carte” offerings over time. Even Buzzfeed is dabbling in the culinary marketplace, selling a Bluetooth-enabled hot plate and a cookbook of popular recipes. Unlike other home goods, kitchen supplies and cookware have relatively stable year-round demand and are rarely subject to the economy’s ebbs and flows, Palmer said. According to a 2016 Harris poll, 97 percent of Americans cook once a week, and nearly a third of the population cooks daily. But although everyone, in theory, needs a pan to fry with, carving out a place for a new cookware company presents challenges. “It’s a really fragmented market, from a brand standpoint,” said AJ Riedel, a housewares analyst at Riedel Group, with more than two dozen different brands, only four of which have more than a 10 percent market share. She said that although Calphalon used to hold a certain reputation with at-home cooks, its prominence has faded. “There’s no aspirational brand,” she said. Which is why, she said, that Made In’s model might have some promise, if it puts an emphasis on educating consumers through its website. There’s evidence that younger shoppers are apt to do research and comparison-shop online before making a purchase, and they’re drawn in by brands that make a strong play on social media and tell a compelling story. Both Riedel and Palmer pointed to Casper Mattresses and Tuft & Needle, two mattress startups that have experienced success with the direct-to-consumer model. They found it compelling that no one had stepped up in the cookware industry to do the same until Made In came along. Malt and Kalick said their intention with Made In is to create a community of cooks and become a “voice in the industry” and an educational source for their users. The company hopes to bring in chefs across the country as equity partners in hopes of building the brand. And the partnership with the Tennessee manufacturer is intentional, because young consumers care about goods being American-made. Derochowski agreed. “Knowing that this is a hot industry, there is going to be a lot of competition,” he said.